A statue of Lord Shiva is in Murudeshwara town in Bhatkal Taluq, Uttara Kannada District in Karnataka. The Statue of Lord Shiva in Murudeshwara is the second biggest statue of Lord Shiva in the world after the statue in Nepal. It is located in the town of Murudeshwara, near the ancient Murudeshwara Temple. The statue and temple are located on the beach in Murudeshwara, which lies on the Arabian Sea coastal line. The Statue of Lord Shiva at Murudeshwara is a very recent construction, but the town and the shrine in the temple are very ancient. There is an interesting legend associated with the history of the temple. The Rakshasa king Ravana of Lanka was a great Shiva Bhaktha. He wanted to gain even more power and immortality by gaining possession of the Atma Linga, a Linga with mystical powers. He performed penance to Lord Shiva. The Divine sage Narada, realizing the havoc Ravana could wreak on Earth if he gained immortality, appeals to Lord Vishnu, who tricks Ravana into asking for Devi Parvati instead of the Atma Linga. Ravana soon realizes his mistake. Once more doing penance, he appeases Lord Shiva again and this time, he does get the Atma Linga. But Maheshwara gives it to him with a condition that he should never place the Linga on the ground. Ravana agrees. Again, to save the world, Sage Narada intervenes. Mahavishnu suddenly creates an illusion of evening during the middle of the day. Ravana, seeing that the sun is about to set, wants to offer Sandhya prayers. But he is in a dilemma as he cannot put the Atma Linga down. Suddenly, a young Brahmachari appears before him. Ravana asks him to hold the Linga while he offers prayers. The young man says he will call out three times before putting it down. Ravana agrees. The boy, who is none other than Lord Ganesha, tricks Ravana and puts down the Linga. The enraged Ravana decides to destroy the Atma Linga. He breaks pieces off it and throws them away. One such piece is believed to have landed in Mrideshwara or Murudeshwara. A shrine was built with a Shiva Linga on top of the piece that fell down here. This is the Murudeshwara temple. 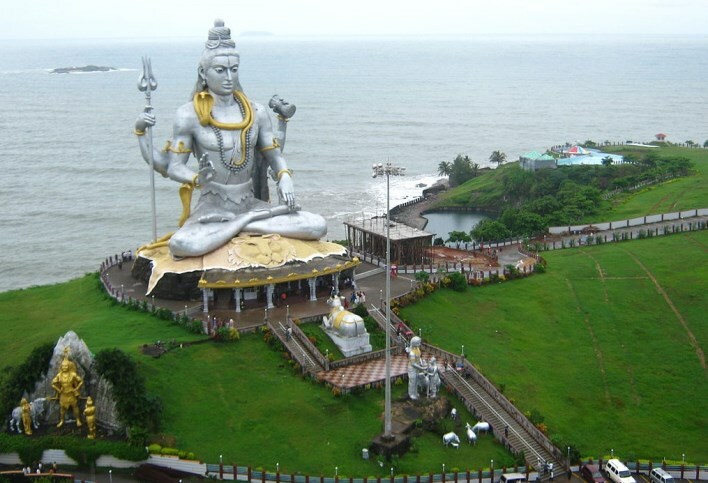 The Statue of Lord Shiva is near the Murudeshwara Temple, which is on top of a small hill called Kanduka Giri. The temple complex is of very recent construction, with a tall 20 storied Gopuram. This temple complex encloses the Murudeshwara shrine which houses the ancient Murudeshwara or Mridesa Linga. Two large, life-size concrete elephants flank the steps leading up to the temple. Near this temple is the Huge Statue of Lord Shiva, 130 ft high. The statue at Murudeshwara was commissioned by businessman and philanthropist Mr. R.N.Shetty. The statue was sculpted by a team of sculptors led by Shivamogga’s Kashinath. The statue has been placed such that it gets direct sunlight. You can get to Murudeshwara by bus. Murudeshwara also has a small Railway Station. Some trains that go between Mumbai and Mangalore stop there. There is no special time to visit this temple. You can visit the temple anytime during the year.